Home > News & Events > An exploration of where art and science meet. An exploration of where art and science meet. For many, the boundary between “art” and “science” has always been a bit blurry. But for a group of students at Mount Holyoke College last semester, that proverbial line was erased altogether. For about six weeks earlier this year, art students in art professor Rie Hachiyanagi’s Advanced Studio course were united with computer science students in associate professor Audrey St. John’s Robotics Workshop class for an exciting experiment in interdisciplinary learning. The idea? When students working in two distinct disciplines come together in common purpose, the connections they make create enhanced awareness of the new area while deepening understanding of the familiar one. The result: a profound learning experience for students that further affirms the belief that curricular innovations like these are the future of the liberal arts. At a reception to unveil the five art projects that students produced, which organizers titled “X-Section” to honor its cross-disciplinary roots, Hachiyanagi and St. John said the venture was a success. From difference, a common experience. Hachiyanagi, an art professor specializing in performance art, installations, and hand papermaking, said she sees many significant similarities between art and science. After connecting through a shared advisee, Hachiyanagi was inspired to brainstorm with her colleague to discuss how they might work together. Both quickly perceived how the skills each discipline teaches are somewhat less represented in the work of the other. St. John said the collaboration gave her computer science students experience with the iterative design process—something surprisingly similar to the software design process—from a different perspective. “In the technology world, people can get into a very narrow space where they don’t always consider the impact that visual and physical properties may have on user interaction,” St. John said. “This gave students direct experience with that. “There’s a lot to be learned from collaboration with someone outside your comfort zone,” she added. Works of art, collaboratively made. 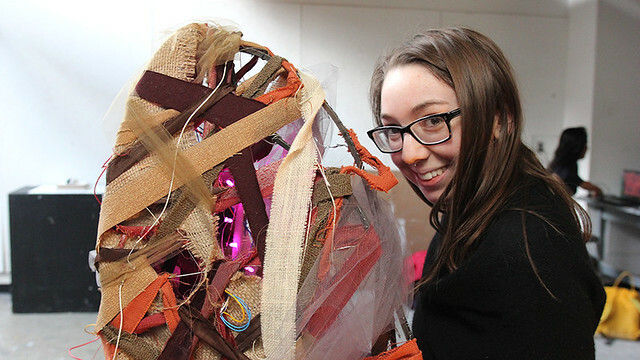 For art studio major Kimberly Dildine ’16, the collaboration with computer science and astronomy major My Trinh ’17 resulted in Sanctuary, a four-scene book made of paper—mainly store-bought but with elements of handmade and hand-dyed Japanese-style paper—and light-emitting diode, or LED, lights. The work was truly collaborative, Dildine said, adding that what Trinh was able to demonstrate with the LEDs had a direct impact on the creative development of the piece. “I originally had a few more images, but the ones I stuck with were the ones that worked best with the lights,” she added. The LED technology underpinning Sanctuary is completely obscured from the viewer. Engineering the concealment of the wires is what Trinh said she enjoyed the most. For both Dildine and Trinh, their respective “X-Section” experiences marked the first time each dabbled in the discipline of the other. That expanded perspective, both faculty members said, is precisely what the “X-Section” project was aiming to create. “This highlights that the two disciplines can really benefit from each other,” St. John said. “This highlights how much potential there is,” Hachiyanagi added. Discover your potential. Learn more.